July is already here! Half the year has gone by, so quickly too. I wanted to make the most of seasonal summer fruit before everything went away. I shared mango recipes last week, and this week I’m going to be baking with cherries!! 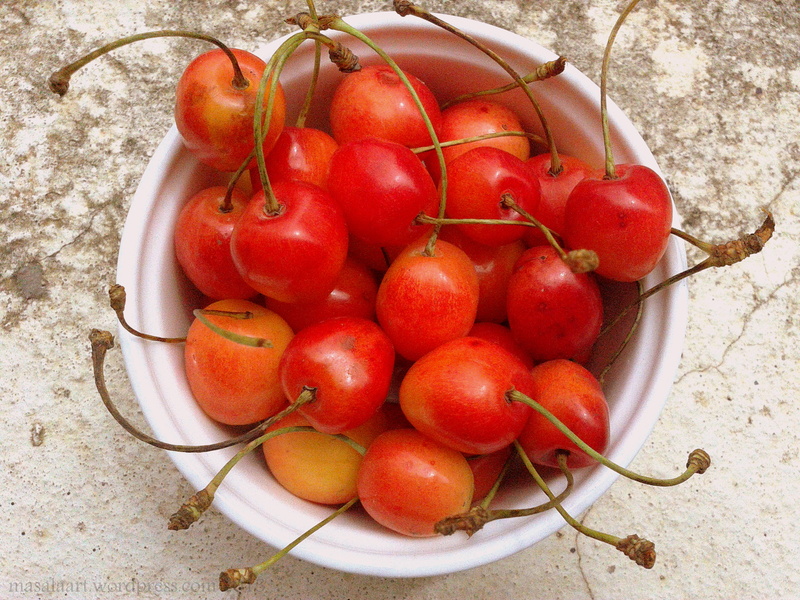 I picked up a box of Kashmiri cherries from my grocer and pitted and chopped some of them today. Don’t let the pale color fool you- they are sweet even though they don’t look it. I was quite surprised myself! ♥ These gorgeous dream kitchens…I definitely want a combination of the sleek and modern + blue kitchen! ♥ These pretty chevron art prints for the kitchen. Retro, colourful and with a little message! ♥ This adorable DIY kiddie reading nook project. ♥ This book. I do love dessert! I eat Bonne Maman out of the jar as well…it is the best jam! It totally is!! Who needs dessert when there’s Bonne Maman?